My Top 3 Ad Campaigns of All Time — Rocketworks Marketing Inc. Okay, so this might be a bit ambitious so early in this blog's life, but here are three ads that stick out to me as my favourites of all time. This ad may rank a little bit higher in my estimation due to my undying love of the mid-‘90s Chicago Bulls. But the ad also uses its celebrity endorsements more effectively than most, especially given how wooden Jordan and Bird are as actors (Bird especially). Instead of forcing them into the role of pitchman, they play out the duo’s greatness to a comical extent, give us all a laugh, and don’t let us forget the ad for, oh, the next 23 years or so. Speaking of ads that have stood the test of time, this Volkswagen ad dates back to 1959! But as you may have noticed from my design portfolio, I've got a lot of love for print, and this might be one of the most iconic print ads of all time. 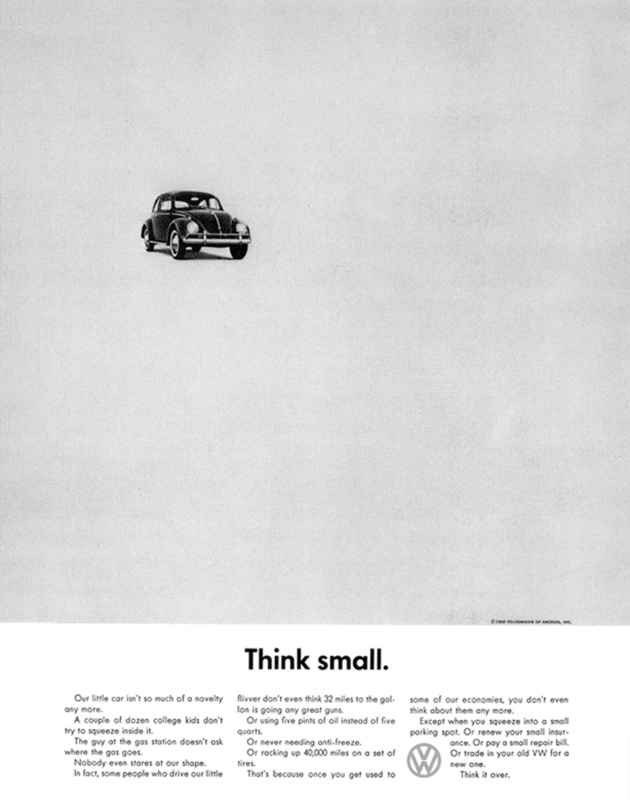 The expansive visual contrasting the tiny Beetle; the subversion of the "bigger is better" theme; the focus on economies before environmentalism was cool; all these were masterstrokes by DDB. Thanks to The Inspiration Room for the ad visual. Check out this post for another great VW print ad from that era. As well, more background on this campaign can be found (unsurprisingly) at Wikipedia. Putting this at number one might be a bit of a stretch. There's no way this ad will have the lasting impact that "Think Small" did or the massive following Jordan vs. Bird generated. But this more recent ad from 2006 does a few things really well, and was made in an era where the degree of difficulty (due to the supersaturated ad market) is quite a bit higher. It starts out with a bang. The flight attendant charging out through the curtain screaming grabs your attention from the first frames of the commercial on. It has perfect comedic timing. Right around the part where she is sobbing into the PA phone is where I start really cracking up. The cuts between the perfectly composed interview shots and the screaming and sobbing shots keep you guessing. The commercial's humour actually ties into what the product does. How often do you tell your friends about a commercial that you thought was really funny—and then you can't remember what the ad was for? (Granted, some industries like insurance or beer may have a harder time illustrating their benefits in a commercial.) But this ad ties in beautifully: I get it: NicoDerm makes you "not crazy"! I don't even need or care about NicoDerm and I get it. The ad was Johnson & Johnson's Global Ad of the Year for 2006 for a reason (tip of the cap to you, Graham Robertson of Beloved Brands, as well as the commercial's star, Canadian actress Anna Silk), and perhaps this is the greatest compliment I can pay it: of all the ads that get overexposed, I never got tired of seeing this one. Now that I've reached the end here, I'm realizing I'm probably forgetting dozens of ads I've loved. (I loved every second of Terry Tate, Office Linebacker, for example.) So hit comment and let me know what your favourites are, or which ad absolutely deserves a spot in my next top three (or top five, or top fifty)!